Locating and isolating network cables can be a frustrating exercise even with a cable toner. Fluke Networks claims to put an end to the confusion with its Intellitone line of toners. 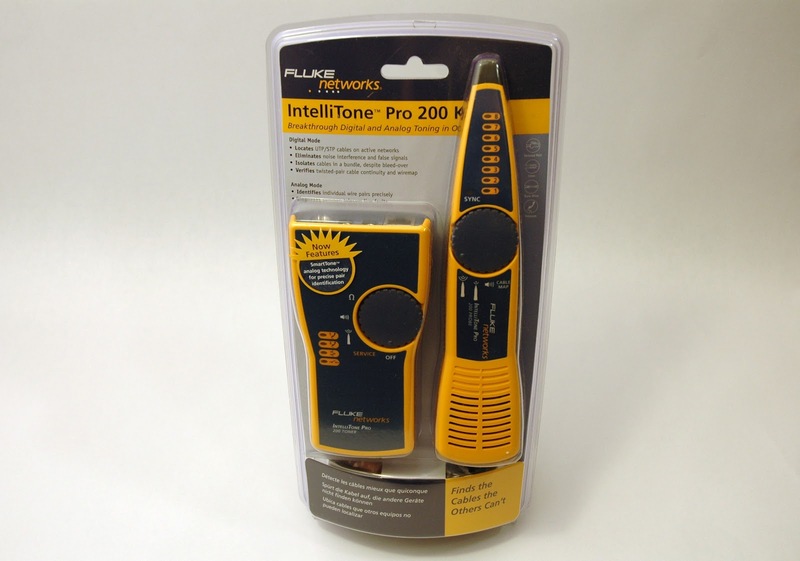 Take a look at the Fluke Networks Intellitone Pro 200 Toner and Probe Kit and see how it stacks up against an analog toner and bundles of cable spaghetti. 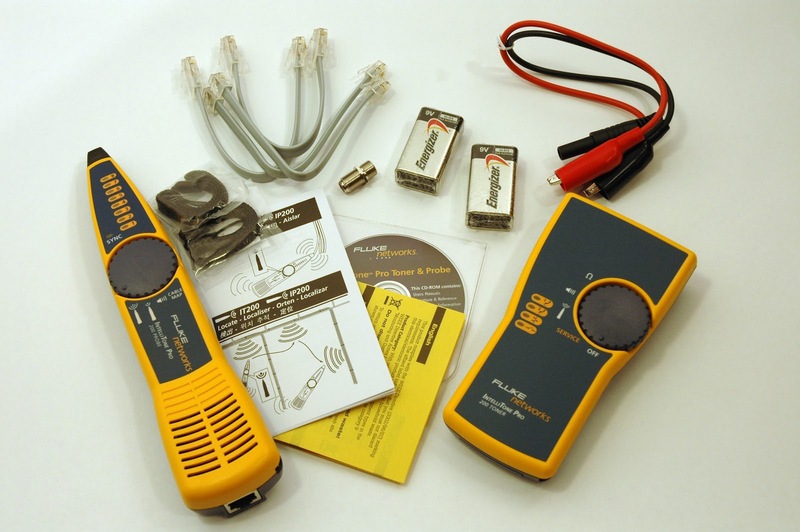 The Fluke Intellitone Pro 200 Toner and Probe Kit includes an Intellitone 200 Probe, an Intellitone 200 Toner, a pile of cables and adaptors, PDF manuals on a mini CD, a quick start guide, and 2) 9 volt batteries. Both the toner and probe have a solid feeling plastic body and ergonomics that seem to have been well thought out. The Intellitone Pro 200 Toner and Probe have several different operating modes. Modes are selected with rotating knobs located on the face of each device and corresponding icons. Many of the icons are the same on both devices but each has unique modes. There are two toning modes for locating and isolating cables. Both modes are available on all of the toner's connectors. Digital toning mode is optimized for unshielded twisted pair cables, while the analog toning mode is optimized for locating unterminated two wire cable runs. The cable map mode tests cables terminated in RJ11 or RJ45 connectors for common wiring faults like open conductors, shorts, and crossed pairs. There are two more modes unique to the toner that don’t require the probe. Service mode checks whether or not telephone or network service is available on a cable or punch-down block, and continuity mode can be used to check for an open or closed circuit. All these modes add value but they also add to the learning curve. 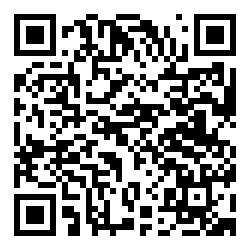 The included PDF manual is straight forward and easy to read. While some of these modes will have more or less value to the individual user, the bread and butter of this device is cable location and isolation. 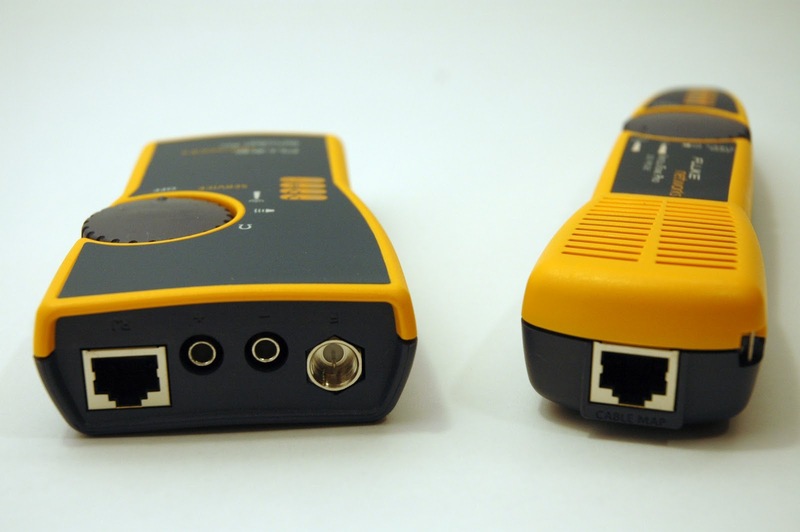 Digital cable location and isolation with the Intellitone Pro 200 can locate cables even when terminated in a network switch. This is one of the biggest shortcomings of analog toners. In a completely unscientific test, I unplugged the network cable from a functioning Cisco IP phone and plugged in an analog toner. The other end of the cable was terminated in a Cisco PoE switch. After about 5 minutes of poking around with the analog probe I gave up trying to find the cable. I replaced the analog toner with the Fluke Intellitone Pro 200 toner and tried to locate the cable with the Fluke Intellitone Pro 200 Probe. It took me about 30 seconds to incorrectly locate the cable and about another minute to be certain that the correct cable was the one adjacent to it in the switch. Thinking I’d throw the analog toner a bone, I disconnected the cable from the switch. At the other end I switched the Fluke toner to “service” and confirmed that the wire was no longer connected to the Ethernet switch. I plugged the analog toner back in and attempted to locate the unterminated wire in the closet. I was able to locate the wire but not quite as fast as I could with the Fluke Networks system even when it was connected to a switch. As I stated, this was a completely unscientific test. I think I could have eventually found the cable with the analog toner as I’ve used them for years and although it’s a struggle, they’ve always helped me locate cables when needed. A good toner is an invaluable tool for many in the networking, cabling, and telephone fields. The quality of analog toners varies widely, but you could get by with a good analog toner. If you’re not working with live network cables, an analog toner might be fine, but using the Fluke Networks devices has been an eye opener. The Intellitone Pro 200 toner and probe are so much better at locating cables than analog toners, especially cables that terminate in network switches, it’s not even a competition. There are other digital toners out there at about the same price point, but with Fluke’s proven name in test equipment and the stellar performance of this product I think you would be hard pressed to do better than the Intellitone Pro 200 Kit. Absolutely the Best Toner on the market, I work in a medical field environment and when I need to locate a terminated cable at any end or just to trace one down, I absolutely cannot waste time, nor can I be unplugging cables just to make an analog toner work. I have even traced cables with the Intellitone Pro 200 Kit out of a room down the hall 100' to find where it was actually routed, as long as the cable is close to the drywall or ceiling tile (a Few Inches of less) you can do a pretty good job of finding which way that wire is running. Tried several times locating wires with several analog toners I have and just gave up after an hour of failures, The next day when I purchase the Intellitone Pro 200 Kit I found my wires within 30 seconds. I will not be caught without it at my side thats for sure.